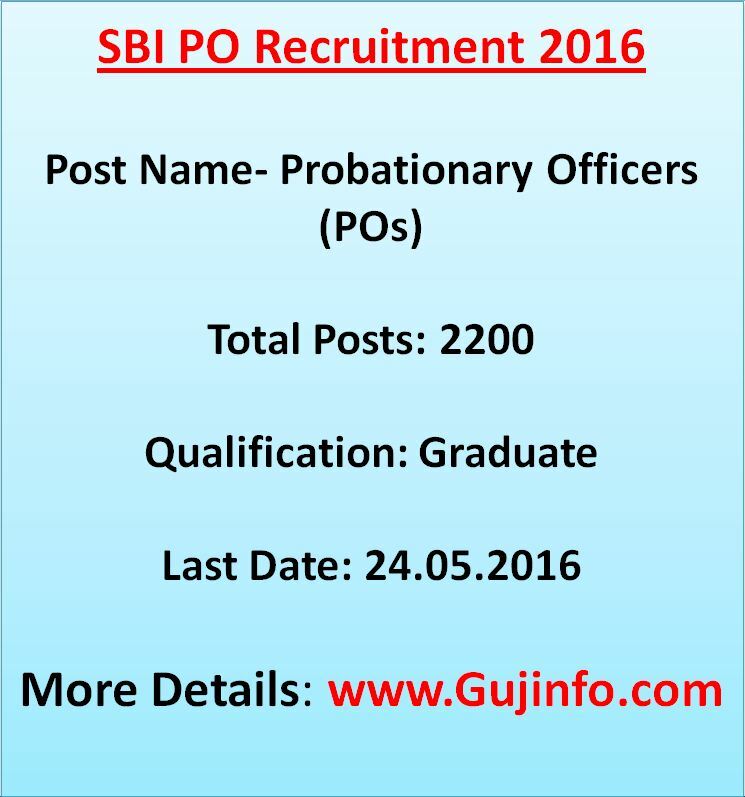 SBI PO 2016 Recruitment Notification Out sbi.co.in, 2200 SBI PO jobs Application process start now last date is May 24, 2016 : The State Bank of India has released an official notification inviting all the interested, eligible candidates to apply for the post of Probationary Officers (PO). The application process for 2200 SBI PO Jobs. The candidates are requested to apply online through prescribed format latest by May 25. SBI PO Recruitment 2016 Notification Out. New Pattern, Salary, Eligibility, Age, Application Fees, application chances are given below. SBI PO Recruitment 2016: The State Bank of India has been decided to hiring the employees for 2200 vacancies at Probationary officer post. This is great news from SBI Bank for those candidates who are looking and waiting for SBI Probationary officer jobs 2016. Interested people will have to apply online for SBI PO Recruitment 2016 from the official website: www.sbi.co.in. About SBI Bank: The state bank of India is the top bank of India with has maximum number of branches all over India. It has 19 government separated banks. The head office of State bank of India is located at Mumbai of India. SBI PO 2016 Educational qualification: All the candidates interested in applying must possess a graduation degree in any discipline from a recognised university or any equivalent qualification recognised by the central government. SBI PO 2016 recruitment Age limit: Not below 21 years and not above 30 years as on 01.04.2016 i.e candidates must have been born not earlier than 02.04.1986 and not later than 01.04.1995 (both days inclusive). Go on ‘career with us’ link and click it. See the advertisement details for SBI PO and click on apply online. The candidates are advised to fill in all the details in prescribed format only. This is it for SBI PO 2016 recruitment notification. You can bookmark (Ctrl+D) this page for all updates related to sbi po 2016. if you get any problem here then visit the official website of IPBS and SBI Bank. We hope that you can easily fill up your online application form to reading this post. SBI website is: www.sbi.co.in. Aa year police ni vacancey Aavani 6e…..